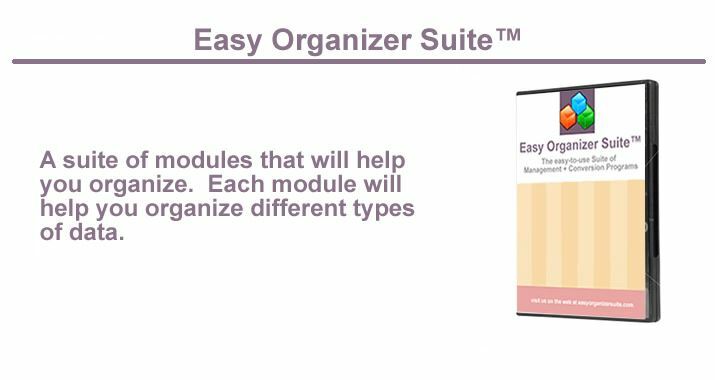 Easy Organizer Suite™ is a suite of programs that will help you organize. It has many different Modules (each sold separately). Each Module organizes different types of things. And the neat thing is, you can view the information from one module to another within the program. 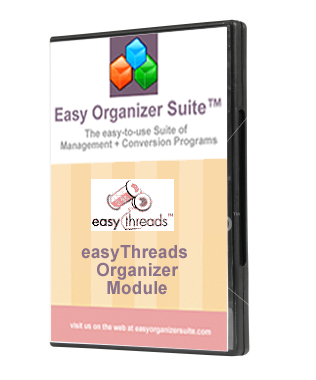 The very first Module is called easythreads Organizer. 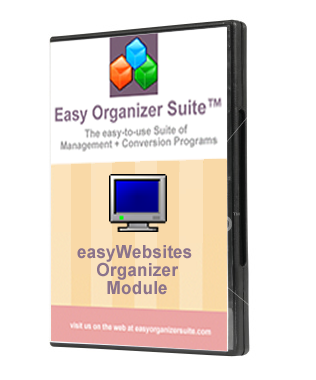 This was a stand-alone program for many years and has become a part of Easy Organizer Suite™. 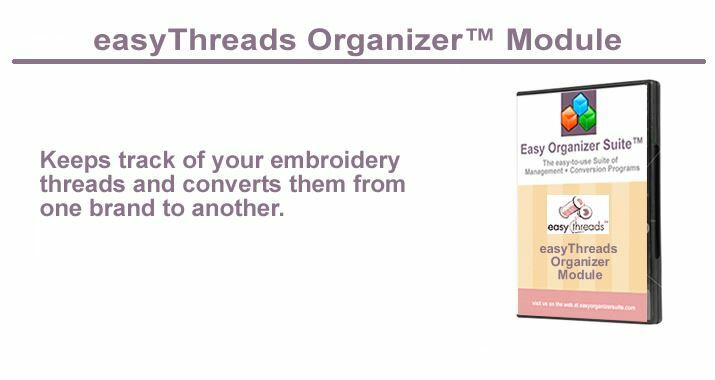 easythreads allows you to keep an inventory of your embroidery threads and convert from one brand to another. 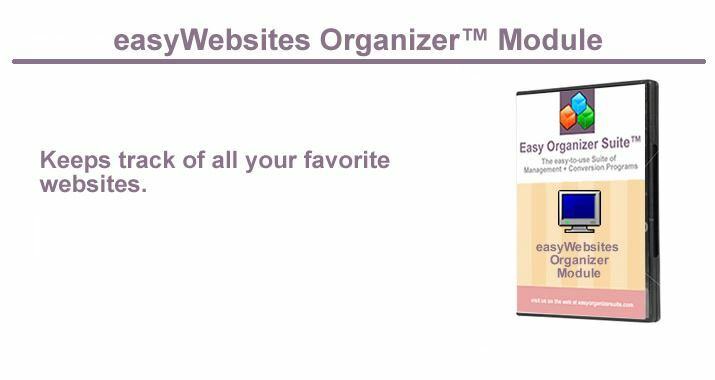 The easyWebsites Organizer helps you organize your favorite websites. You can keep so much more information than Internet Explorer's Favorites or Firefox's Bookmarks, and you can link the websites to your Design Charts in the easythreads Module! In the Pro Edition, you can import favorites from Internet Explorer or Bookmarks from Firefox. 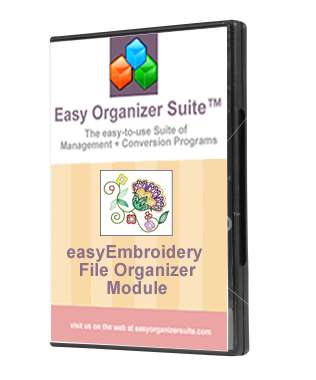 The easyEmbroidery File Organizer Module helps you organize your embroidery files. You can put your embroidery files in one or more categories and add keywords to them to help you find them easily. You can link the embroidery files to your Design Charts in the easythreads Module and Websites Charts in easyWebsites Organizer! In the Pro Edition, you can import all of your embroidery files from disk, and you can convert embroidery designs from one supported format to another. 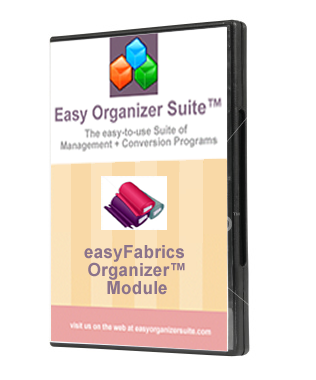 The easyFabrics Organizer™ helps you organize your fabrics. 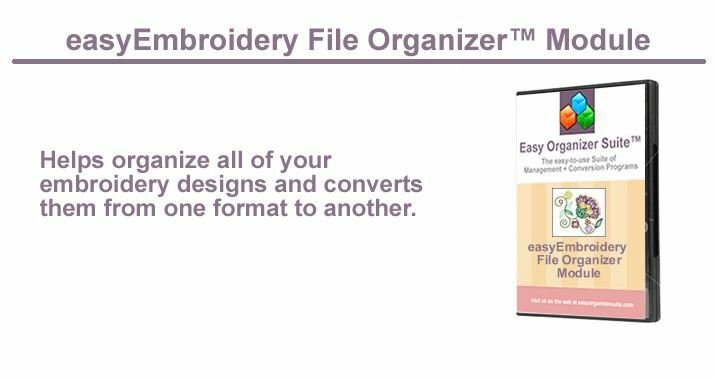 You can link the fabrics to your Design Charts in the easyThreads Organizer™ Module or the Embroidery File Charts in easyEmbroidery File Organizer™! You can keep track of your fabrics in My Inventory Fabrics, and you can even keep a list of all the fabrics you want to get in My Wishlist Fabrics. In the Pro Edition, you can import Fabric Data Packs to expand the system fabrics to choose from. The easyQuiltPatterns Organizer™ helps you organize your quilt patterns. You can keep track of the quilt patterns that you own in My Inventory Quilt Patterns, and you can even keep a list of all the quilt patterns you want to get in My Wishlist Quilt Patterns. In the Pro Edition, you can import Quilt Pattern Data Packs to expand the system quilt patterns to choose from. You can link the quilt patterns to your Fabric Charts in the easyFabrics Organizer™ Module or the Embroidery File Charts in easyEmbroidery File Organizer™! 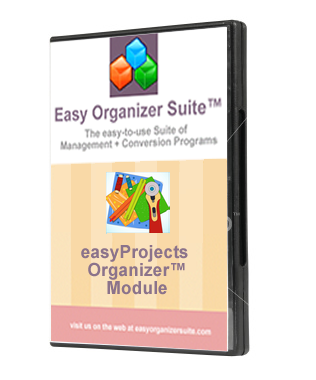 The easyProjects Organizer™ helps you organize your projects. You can keep track of the projects that you have created in My Inventory Projects, and you can even keep a list of all the projects you want to create in My Wishlist Projects. You can link the projects to your Fabric Charts in the easyFabrics Organizer™ Module or the Embroidery File Charts in easyEmbroidery File Organizer™! The easySewingPatterns Organizer™ helps you organize your sewing patterns. You can keep track of the sewing patterns that you have created in My Inventory Sewing Patterns, and you can even keep a list of all the sewing patterns you want to create in My Wishlist Sewing Patterns. You can link the sewing patterns to your Fabric Charts in the easyFabrics Organizer™ Module or any other charts in other modules! Check out the video to see how Easy Organizer Suite™ works!